Those who love to go walking in the Lake District can be forgiven for regarding the Windermere area as being far from quiet and unspoilt. With so many crowds of daytrippers, boats and tourist attractions, idyllic and peaceful are not words that come to mind. However, this is only really true of the area stretching from Bowness-on-Windermere to Ambleside. The southern stretch of the lake is much quieter, while the western shore is almost uninhabited. Those who take the Bowness to Sawrey ferry will find no busy A roads, no tourist cafes and gift shops, hotels or boat hire. This side is marked by tracks and minor roads, plus the steep-sided woodland of Claife Heights. This quieter area stretches as far as Esthwaite water and the village of Hawkshead, with the only gaps in the woods being made up of fairly low hilltops and a number of tarns, some of which are artificial. 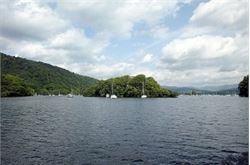 It is in this area that a guided walk by Lake District National Park rangers takes place on September 18th. Starting at the national park car park in Hawkshead at 10:30 BST, the 6.9-mile walk passes through areas of woodland before reaching the top of Latterborrow, a green hilltop of modest height compared with most fells, but a panoramic view in all directions. From here it passes Blelham Tarn, a natural and large sheet of water, before reaching Wray Castle, a 19th-century edifice built to look much older. Good walking gear such as walking boots and waterproofs will be needed, but this is a trek many will find is ample proof of the quality of scenery that can be enjoyed on the west side of Windermere, with not a hint of a crowd outside of Hawkshead itself. Blelham Tarn is passed by a public right of way and much of its shore is on access land, although walkers should be warned that much of this is very marshy.